Trellis placement in the garden is important, whether you are using it as a plant support, privacy wall or architectural element. Ideally a trellis is secured to a solid structure, such as a fence, but it is important to make sure that the trellis support system will be able to hold up the type of plant you are growing on it once it hits maturity. Keep in mind some important points when securing a trellis to a fence, such as proper tools and ensuring that the trellis is not going to fall off. 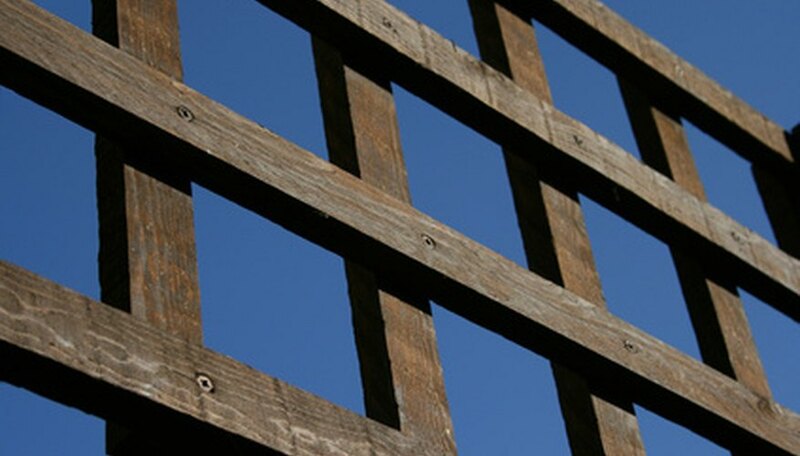 Set the lattice holes in the top of the trellis over the chain link fence where the links poke up further on top. Set it as evenly as possible, carefully working so you know the trellis is secure. Use the ties to tighten up the support of the trellis to the fence, focusing on both sides and the middle. Set the trellis against the wood, rock or stone fence. Use the level to ensure the trellis is even on the wall. Use a marker to pinpoint the places where you want to insert the trellis hooks on the left and right side (also the center if you want the added support). Drill into the fence about 1 to 1 1/2 inches deep to make the trellis hook holes, right where you marked. Manually insert the hooks into the holes, twisting them until they are sturdy and tight. Set the trellis carefully and firmly onto the hooks through the top lattice holes in the trellis. Make sure it is even and sturdy on the wall so it can support the weight of a mature plant. Pick a sturdy area of your fence that has the specific sun requirements for the plants you are going to secure to the trellis. Consider the type of fence you have. For metal chain link fences, a trellis can be positioned from the top with some thick plastic ties. For wood, rock or stone fences, use trellis hooks and a power drill.